Pattern and Process of Fungal Evolution. We study the pattern and process of fungal evolution. We started by studying the pattern of evolution in terms of species and populations and now have begun to study the process. Our long term goal is to make fungi the best models for evolutionary biology. We focus on the key evolutionary event that forms the tree of life: speciation. Recently we have documented species divergences, compared phylogenetic and biological methods of species recognition, addressed the timing of species divergence, and evaluated selection acting on potentially adaptive genes. Now, we are using genetics and genomics to find genes that maintain species and facilitate adaptation. Figure 1. [right] Bayesian phylogeny made from exon sequence from Neurospora crassa isolates showing two, genetically differentiated populations in what had been thought to be one population. 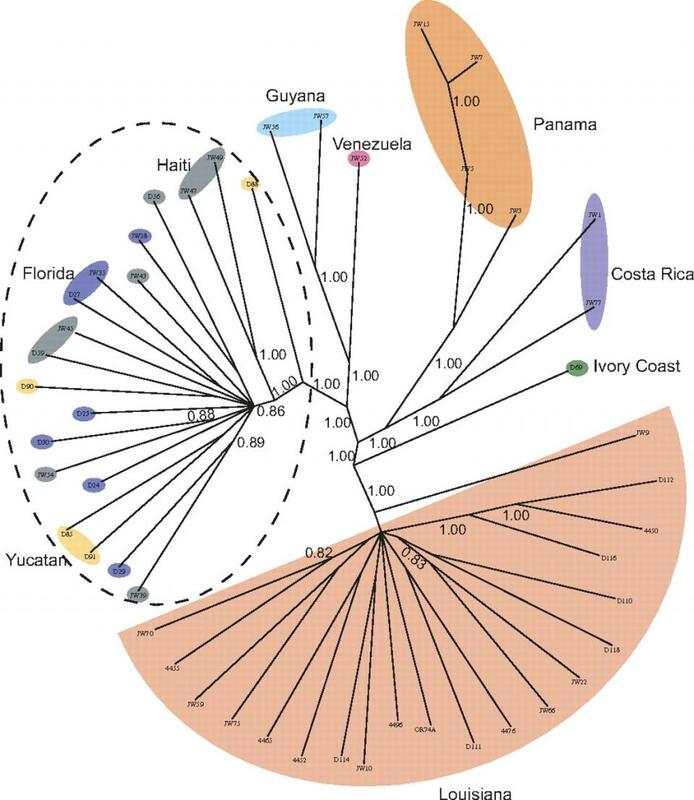 Comparison of the genomes of the Louisiana and Caribbean (dotted line) populations revealed the "islands of differentiation" seen in Figure 2. (Ellison et al. 2011. PNAS 107:2831-2836). Figure 2. [above] Island of differentiation. (A. chromosome 3, B chromosome 7) uncovered by genome scans of Neurospora crassa individuals from the Louisiana (LA) and Caribbean (Carib) populations. Genes in these islands are candidates for those important to adaptation. The mean annual low temperature in Louisiana is 10 degrees C lower in than the Caribbean and,using growth as a measure of fitness, Louisiana individuals were more fit than Caribbean individuals at low temperature. A Louisiana strain with a gene deletion for PAC 10 (prefoldin) or for MRH4 (RNA helicase) also showed lower fitness than wild type at low temperature, leaving intact our hypothesis that genes in the islands are important for adaptation to growth at low temperature. (Ellison et al. 2011. PNAS 107:2831-2836). Wise, H-Z, Hung, C-Y, Whiston, E, Taylor, JW, Cole GT. 2013. Extracellular ammonia at sites of pulmonary infection with Coccidioides posadasii contributes to severity of the respiratory disease. Microbial Pathogenesis 59-60: 19-28. John W. Taylor and Christopher E. Ellison. 2010. Mushrooms: Morphological complexity in the fungi. PNAS 107(26): 11655-11656. Jeremey R. Dettman, David J. Jacobson and John W. Taylor. 2006. Multilocus sequence data reveal extensive phylogenetic species diversity within the Neurospora discreta complex. Mycologia 98(3): 436–446. Högberg, Nils, Kroken, Scott, Thor, Göran & Taylor, John W. 2002. Reproductive mode and genetic variation suggest a North American origin of European Letharia vulpina. Molecular Ecology 11 (7): 1191-1196. Scott Kroken and John W. Taylor. 2001. A gene genealogical approach to recognize phylogenetic species boundaries in the lichenized fungus Letharia. Mycologia 93: 38–53. Jeremy R. Dettman, Fred M. Harbinski, John W. Taylor. 2001. Ascospore morphology is a poor predictor of the phylogenetic relationships of Neurospora and Gelasinospora. Fungal Genetics and Biology 34(1): 44-61. David M. Geiser, Joe W. Dorner, Bruce W. Horn and John W. Taylor. 2000. The phylogenetics of mycotoxin and sclerotium production in Aspergillus flavus and Aspergillus oryzae. Fungal Genetics and Biology 31(1): 169-179. Fisher MC, Koenig GL, White TJ, Taylor JW. 2000. Pathogenic clones versus environmentally driven population increase: analysis of an epidemic of the human fungal pathogen Coccidioides immitis. Journal of Clinical Microbiology 38(2): 807-13. Greene, D. R., G. L. Koenig and J. W. Taylor. 1999. Soil isolation and molecular identification of Coccidioides immitis. Abstracts of the General Meeting of the American Society for Microbiology 99: 494. Fisher, M. C., G. L. Koenig, T. J. White and J. W. Taylor. 1999. Pathogenic clones or environmentally driven population expansion? Molecular and epidemiological analyses of the 1991-1994 Californian epidemic of the human fungal pathogen Coccidioides immitis. Abstracts of the General Meeting of the American Society for Microbiology 99: 318-319. Saenz, G. S. and J. W. Taylor. 1999. Phylogeny of the Erysiphales (powdery mildews) inferred from internal transcribed spacer ribosomal DNA sequences. Canadian Journal of Botany 77(1): 150-168. Saenz, G. S. and Taylor, J. W. 1999. Phylogenetic relationships of Meliola and Meliolina inferred from nuclear small subunit rRNA sequences. Mycological Research, volume 103 (8) August 1999: 1049-1056. Skouboe, P., Frisvad, J. C., Taylor, J. W., Lauritsen, D., Boysen, M. & Rossen, L. 1999. Phylogenetic analysis of nucleotide sequences from the ITS region of terverticillate Penicillium species. Mycological Research. Volume 103 (7): 873-881. Taylor, J. W., D. J. Jacobson and M. Fisher. 1999. The evolution of asexual fungi: reproduction, speciation and classification. Annual Review of Phytopathology. 37: 197-246. Herr, Roger A., Libero Ajello, John W. Taylor, Sarath N. Arseculeratne and Leonel Mendoza. 1999. Phylogenetic Analysis of Rhinosporidium seeberi's 18S Small-Subunit Ribosomal DNA groups this pathogen among members of the protoctistan Mesomycetozoa clade. J. Clin. Microbiol. 1999 37: 2750-2754. Kasuga, T., Taylor, J.W., White, T.J. (1999). Phylogenetic relationships of varieties and geographical groups of the human pathogenic fungus Histoplasma capsulatum darling. Journal of Clinical Microbiology 37(3): 653-663. Fisher, M. C., T. J. White and J. W. Taylor. 1999. Primers for genotyping single nucleotide polymorphisms and microsatellites in the pathogenic fungus Coccidioides immitis. Molecular Ecology 8(6): 1082-1084. Berbee, M. and Taylor, J.W. 1999. Fungal phylogeny. Pp. 21-77. In: Molecular Fungal Biology (Oliver, R.P. and Schweizer, M. eds. ), Cambridge University Press. Taylor, J.W., D.M. Geiser, Burt, A., Koufopanou, V. 1999. The evolutionary biology and population genetics underlying fungal strain typing. Clinical Microbiology Reviews 12(1): 126-146. Geiser, David M. and John W. Taylor. 1998. Cause of sea fan death in the West Indies. Nature 394: 137-138. Geiser, David M., Jens C. Frisvad, John W. Taylor. 1998. Evolutionary relationships in Aspergillus section Fumigati inferred from partial beta-tubulin and hydrophobin DNA sequences. Mycologia: Vol. 90, No. 5, pp. 831-845. Geiser, D.M. ; Pitt, J.I. ; Taylor, J.W. 1998. Cryptic speciation and recombination in the aflatoxin-producing fungus Aspergillus flavus. Proceedings of the National Academy of Sciences of the United States of America, 1998 January 6, V95 N1: 388-393. Rosendahl, S., Taylor, J.W. 1997. Development of multiple genetic markers for studies of genetic variation in arbuscular mycorrhizal fungi using AFLP(TM) Molecular Ecology, v.6, n.9, (1997): 821-829. Carter, DA; Burt, A; Taylor, JW; Koenig, GL; and others. A set of electrophoretic molecular markers for strain typing and population genetic studies of Histoplasma capsulatum. Electrophoresis, v.18, n.7, (1997): 1047-1053. Burt, A; Dechairo, B.M. ; Koenig, G.L. ; Carter, D.A. ; White, T.J.; Taylor, J.W. 1997. Molecular markers reveal differentiation among isolates of Coccidioides immitis from California, Arizona and Texas. Molecular Ecology, v.6, n.8, (1997): 781-786. Koufopanou, V; Burt, A; Taylor, J W. 1997. Concordance of gene genealogies reveals reproductive isolation in the pathogenic fungus Coccidioides immitis. Proceedings of the National Academy of Sciences of the United States of America, v.94, n.10, (1997): 5478-5482. Lobuglio, K F; Berbee, M L; Taylor, J W. 1996. Phylogenetic origins of the asexual mycorrhizal symbiont Cenococcum geophilum Fr. and other mycorrhizal fungi among the ascomycetes. Molecular Phylogenetics and Evolution, v.6, n.2, (1996): 287-294. Carter, D A; Burt, A; Taylor, J W; Koenig, G L; White, T J. 1996. Clinical isolates of Histoplasma capsulatum from Indianapolis, Indiana, have a recombining population structure. Journal of Clinical Microbiology, v.34, n.10, (1996): 2577-2584. Spanggaard, B., Skouboe, P., Rossen, L., Taylor, J.W. 1996. Phylogenetic relationships of the intercellular fish pathogen, Ichthyophonus hoferi, and fungi, choanoflagellates and the rosette agent. Marine Biology V126 N1: 109-115. Bowman, B H; White, T J; Taylor, J W. 1996. Human pathogenic fungi and their close nonpathogenic relatives. Molecular Phylogenetics and Evolution, v.6, n.1, (1996): 89-96. Swann, E C; Taylor, J W. 1995. Toward a phylogenetic systematics of the basidiomycota: Integrating yeasts and filamentous basidiomycetes using 18S RRNA gene sequences. Studies in Mycology, n.38, (1995): 147-161. Kwong-Chung, K. J., Chang, Y. C., Bauer, R., Swann, E. C., Taylor, J. W. and Goel, R. 1995. The characteristics that differentiate Filobasidiella depauperata from Filobasidiella neoformans. Studies in Mycology (38): 67- 79. Taylor, J W. 1995. Making the Deuteromycota redundant: A practical integration of mitosporic and meiosporic fungi. Canadian Journal of Botany, v.73, n.SUPPL. 1 SECT. E-H, (1995): S754-S759. Berbee, M L; Taylor, J W. 1995. From 18S ribosomal sequence data to evolution of morphology among the fungi. Canadian Journal of Botany, v.73, n.SUPPL. 1 SECT. E-H, (1995): S677-S683. Taylor, J.W. 1995. Molecular phylogenetic classification of fungi. Arch. Med. Research 26: 307-314. Swann, E. C; Taylor, J. W. 1995. Phylogenetic diversity of yeast-producing basidiomycetes. Mycological Research, v.99, n.10, (1995): 1205-1210. Burt, A., Carter, D.A., Koenig, G.L., White, T.J., and Taylor, J.W. 1995. Safe extraction of DNA from the human pathogen Coccidioides immitis (Ascomycota). Fungal Genetics Newsletter 42: 23. Carter, D.A., Burt, A., and Taylor, J.W. 1995. Direct analysis of specific bands from arbitrarily primed PCR reactions. pp. 325-332. In: PCR Strategies. M.A. Innis, D.H. Gelfand and J.J. Sninsky (eds.) Academic Press. Berbee, M L; Yoshimura, A; Sugiyama, J; Taylor, J W. 1995. Is Penicillium monophyletic? An evaluation of phylogeny in the family Trichocomaceae from 18S, 5.8S and ITS ribosomal DNA sequence data. Mycologia, v.87, n.2, (1995): 210-222. Gargas, A., DePriest, P.T. and Taylor, J.W. 1995. Positions of multiple insertions in SSU rDNA of lichen-forming fungi. Mol Biol Evol 12: 208-218. LoBuglio, K.F. and Taylor, J.W. 1995. Phylogeny and PCR identification of the human pathogenic fungus Penicillium marneffei. J. Clin. Microbiol. 343: 85-89. Taylor, J.W. and LoBuglio, K.F. 1994. Ascomycete phylogenetics: morphology and molecules. Mycoscience 35: 109-112. Taylor, J.W., Swann, E., and Berbee, M.L. 1994. Molecular evolution of ascomycete fungi: phylogeny and conflict. pp. 201-211. In: First International Workshop on Ascomycete Systematics. D.L. Hawskworth (ed. ), Plenum Press, New York. Burt, A., Carter, D.A., White, T.J., and Taylor, J.W. 1994. DNA sequencing with arbitrary primer pairs. Molecular Ecology, v.3, n.5, (1994): 523-525. Berbee, M.L., and Taylor, J.W. 1994. 18S ribosomal DNA sequence data and dating, classifying and ranking the fungi. Pp. In: First International Workshop on Ascomycete Systematics. D.L. Hawskworth (ed. ), Plenum Press, New York. Saenz, G.S., Taylor, J.W., and Gargas, A. 1994. 18S rRNA gene sequences and supraordinal classification of the Erysiphales. Mycologia 86: 212-216. Lobuglio, K F; Pitt, J I; Taylor, J W. 1994. Independent origins of the synnematous Penicillium species, P. duclauxii, P. clavigerum and P. vulpinum, as assessed by two ribosomal DNA regions. Mycological Research, v.98, n.2, (1994): 250-256. Mitchell, T.G., Freedman, E.Z., White, T.J., and Taylor, J.W. 1994. Unique oligonucleotide primers for the polymerase chain reaction to identify Cryptococcus neoformans. J. Clin. Microbiol. 32: 253-255. Taylor, J.W. and Swann, E. 1994. DNA from herbarium specimens. pp. 166-181. In: Ancient DNA, B. Herrmann and S. Hummel (eds. ), Springer-Verlag, New York. Carter, D A; Burt, A; Taylor, J W; White, T J. PCR-based molecular genotyping in Histoplasma capsulatum. (94th General Meeting of the American Society for Microbiology, Las Vegas, Nevada, USA, May 23-27, 1994). Abstracts of the General Meeting of the American Society for Microbiology, v.94, (1994): 589. Swann, E.C. and J.W. Taylor. 1993. Higher taxa of basidiomycetes: an 18S rRNA gene perspective. Mycologia 85: 923-936. Taylor, J.W., Bowman, B, Berbee, M.L., and White, T.J. 1993. Fungal model organisms: phylogenetics of Saccharomyces, Aspergillus and Neurospora. Systematic Biology 42: 440-457. Berbee, M.L. and Taylor, J.W. 1993. Dating the evolutionary radiations of the true fungi. Can. J. Bot. 71: 1114-1127. Blackwell, M., Spatafora, J.W., Malloch, D. and Taylor, J.W. 1993. Consideration of higher taxonomic relationships involving Pyxidiophora. Pp. 105-108. In: Ceratocystis and Ophiostoma: Taxonomy, Ecology and Pathology. Eds., Wingfield, M.J., K.A. Seifert, and J.F. Webber, APS, St.Paul. Lee, S.B. and Taylor, J.W. 1993. Uniparental inheritance and replacement of mitochondrial DNA in Neurospora tetrasperma. Genetics. 134: 1063-1075. LoBuglio, KF., Pitt, J.I., and Taylor, J.W. 1993. Phylogenetic analysis of two ribosomal DNA regions indicates multiple independent losses of a sexual Talaromyces state among asexual Penicillium species in subgenus Biverticillium. Mycologia 85: 592-604. Taylor, J.W. and Bowman, B.H. 1993. Pneumocystis carinii and the ustomycetous red yeast fungi. Molecular Microbiology 8:4 25-426. Mitchell, T.G., Freedman, E.Z., Meyer, W., White, T.J., and J.W. Taylor. 1993. PCR identification of Cryptococcus neoformans. pp. 431-436. In: Diagnostic Molecular Microbiology: Principles and Applications, D.H. Persing, T.F. Smith, F.C. Tenover, and T.J. White (eds. ), American Society for Microbiology, Washington. Taylor, J.W. 1993. A contemporary view of the holomorph: nucleic acid sequence and computer databases are changing fungal classification. Pp. 3-13. In: The Fungal Holomorph: Mitotic, Meiotic and Pleomorphic Speciation in Fungal Systematics. D.R. Reyolds and J.W. Taylor (eds. ), C.A.B., International, Surrey. Berbee, M.L. and Taylor, J.W. 1993. Ascomycete relationships: Dating the origin of asexual lineages iwth 18S ribosomal RNA gene sequence data. Pp. 67-78. In: The Fungal Holomorph: Mitotic, Meiotic and Pleomorphic Speciation in Fungal Systematics. D.R. Reyolds and J.W. Taylor (eds. ), C.A.B., International, Surrey. LoBuglio, K.F. and Taylor, J.W. 1993. Molecular phylogeny of Talaromyces and Penicillium species in subgenus Biverticillium. pp. 115-119. In: The Fungal Holomorph: Mitotic, Meiotic and Pleomorphic Speciation in Fungal Systematics. D.R. Reyolds and J.W. Taylor (eds. ), C.A.B., International, Surrey. Bowman, B.H. and Taylor, J.W. 1993. Molecular phylogeny of pathogenic and non-pathogenic Onygenales. pp. 169-178. In: The Fungal Holomorph: Mitotic, Meiotic and Pleomorphic Speciation in Fungal Systematics. D.R. Reyolds and J.W. Taylor (eds. ), C.A.B., International, Surrey. Reynolds, D.R. and Taylor, J.W. 1993. The Fungal Holomorph: Mitotic, Meiotic and Pleomorphic Speciation in Fungal Systematics. C.A.B., International, Surrey, 375 p.
Lee, S.B., White, T.J. and Taylor, J.W. 1993. Detection of Phytophthora species by oligonucleotide hybridization to amplified ribosomal DNA spacers. Phytopathology 83: 177- 181. Berbee, M.L and Taylor, J.W. 1992. Detecting morphological convergence in true fungi using 18S rRNA gene sequence. BioSystems 28: 117-125. Berbee, M.L., Kloeckener, B. and Taylor, J.W. 1992. Yeast biology (letter). Science 257: 1610-1611. Bowman, B.H., Taylor, J.W. and White, T.J. 1992. Molecular evolution of the fungi: human pathogens. Molec. Biol. Evol. 9: 893-904. Gargas, A. and J.W. Taylor. 1992. Polymerase chain reaction (PCR) primers for amplifying and sequencing nuclear 18S rDNA from lichenized fungi. Mycologia 84: 589-592. Berbee, M.L. and J. W. Taylor. 1992. Convergence in ascospore discharge mechanism among pyrenomycete fungi based on 18S ribosomal DNA sequence. Molec. Phylogenetics and Evol. 1: 59-71. Mitchell, T.G., White, T.J., and J.W. Taylor. 1992. Comparison of 5.8S ribosomal DNA sequences among the basidiomycetous yeast genera Cystofilobasidium, Filobasidium and Filobasidiella. J. Med. Vet. Mycol. 30: 207-218. Lee, S.B. and Taylor, J.W. 1992. Phylogeny of five Phytophthora species inferred from the internal transcribed spacers of ribosomal DNA. Molec. Biol. Evol. 9: 636-653. Reynolds, D.R. and Taylor, J.W. 1992. Article 59: reinterpretation or revision? Taxon 41: 91-98. Berbee, M.L. and J.W. Taylor. 1992. 18s ribosomal RNA gene sequence characters place the human pathogen Sporothrix schenckii in the genus Ophiostoma. Exper. Mycol. 16: 87-91. Bowman, B.H., Taylor, J.W., Brownlee, A.G. Lee, J., Lu, S.- D. and White, T.J. 1992. Molecular evolution of the fungi: relationship of the Basidiomycetes, Ascomycetes and Chytridiomycetes. Molec. Biol. Evol. 9: 285-296. Berbee, M.L. and Taylor, J.W. 1992. Two Ascomycete classes based on fruiting-body characters and ribosomal DNA sequence. Molec. Biol. Evol. 9: 278-284. Reynolds, D.R. and Taylor, J.W. 1991. Nucleic acids and nomenclature: name stability under article 59. In: Improving the Stability of Names: Needs and Options (D.L. Hawksworth, ed.). Regnum Vegetabile 123: 171-177. Bruns, T. D., White, T. J. and Taylor, J. W. 1991. Fungal Molecular Systematics. Annual Review of Ecology and Systematics, Vol. 22. (1991), pp. 525-564. Gardes, M., White, T.J., Fortin, J.A., Bruns, T.D. and Taylor, J.W. 1991. Identification of indigenous and introduced symbiotic fungi in ectomycorrhizae by amplification of nuclear and mitochondrial ribosomal DNA. Can. J. Bot. 69: 180-190. Reynolds, D.R. and Taylor, J.W. 1991. DNA specimens and the 'International code of botanical nomenclature'. Taxon 40: 311-315. Reynolds, D.R. and Taylor, J.W. 1991. Higher fungi genera: their holomorphic content. pp. 61-75. In: Generic Concepts in Mycology (H. Clemencon, ed.). Second Herbetts Symposium, Univ. Lausanne. Taylor, J.W., Pitt, J.I. and Hocking, A.D. 1990. Ribosomal DNA restriction studies of Talaromyces species with Paecilomyces and Penicillium anamorphs . In: Modern Concepts in Penicillium and Aspergillus Classification (R.A. Samson and J.I. Pitt, eds.). Plenum Press, New York, pp. 357-370. Bruns, T.D., Fogel, R. and Taylor, J.W. 1990. Amplification and sequencing of DNA from fungal herbarium specimens. Mycologia 82(2): 175-184. Lee, S.B. and Taylor, J.W. 1990. Isolation of DNA from fungal mycelia and single spores. Chapter 34. In: PCR Protocols: A Guide to Methods and Applications (M. Innis, D. Gelfand, J. Sninsky and T. White , eds.). Academic Press, Orlando, Florida. White, T.J., Bruns, T., Lee, S. and Taylor, J. 1990. Amplification and direct sequencing of fungal ribosomal RNA genes for phylogenetics. Chapter 38. In: PCR Protocols: a Guide to Methods and Applications (M. Innis, D. Gelfand, J. Sninsky and T. White, eds.). Academic Press, Orlando, Florida. Taylor, J.W. and Natvig, D.O. 1989. Mitochondrial DNA and evolution of heterothallic and pseudohomothallic Neurospora species. Mycol. Res. (formerly Trans. Brit. Mycol. Soc.) 93: 257-272. May, G. and Taylor, J.W. 1989. Independent transfer of mitochondrial plasmids in Neurospora crassa. Nature 339: 320-322. May, G. and Taylor, J.W. 1988. Patterns of mating and mitochondrial DNA inheritance in the agaric basidiomycete Coprinus cinereus. Genetics 118: 213-220. Lee, S.B., Milgroom, M.G. and Taylor, J.W. 1988. A rapid, high yield mini-prep method for isolation of total genomic DNA from fungi. Fungal Genetics Newsletter 35: 23-24. Otrosina, W.J., Chase, T.E., Cobb, F.W, and Taylor, J.W. 1988. Biological species and host specialization in Heteorbasidion annosum, the causal organism of annosus root-rot. Northwest Environmental Journal 4: 335-336. Natvig, D.O., Jackson, D.A. and Taylor, J.W. 1987. Random-fragment hybridization analysis of evolution in the genus Neurospora: the status of four-spored strains. Evolution 41: 1003-1021. Taylor, J.W. and Natvig, D.O. 1987. Isolation of fungal DNA. In: Zoosporic Fungi in Teaching and Research (M.S. Fuller and A. Jaworski, eds.). Southeastern Publishing Corporation, Athens, GA. pp. 252-258. Taylor, J.W. 1986. Fungal evolutionary biology and mitochondrial DNA. Exp. Mycol. 10: 259-269. Kwok, S., White, T.J. and Taylor, J.W. 1986. Evolutionary relationships between fungi, red algae, and other simple eukaryotes inferred from DNA hybridizations to a cloned basidiomycete rDNA. Exp. Mycol. 10: 196-204. Taylor, J.W., Smolich, B.D. and May, G. 1986. Evolution and mitochondrial DNA in Neurospora crassa. Evolution 40: 716-739. Taylor, J.W., Smolich, B.D. and May, G. 1985. Evolutionary comparison of homologous mitochondrial plasmid DNAs from three Neurospora species. Mol. Gen. Genet. 201: 161-167. Taylor, J.W. and Smolich, B.D. 1985. Molecular cloning and physical mapping of the Neurospora crassa 74-OR23-1A mitochondrial genome. Current Genetics 9: 597-603. Taylor, J.W. 1985. Mitosis in the basidiomycete fungus Tulasnella araneosa. Protoplasma 126: 1-18. Natvig, D.O., May, G. and Taylor, J.W. 1984. Distribution and evolutionary significance of mitochondrial plasmids in Neurospora. J. Bacteriol. 159: 288-293. Taylor, J.W. 1984. Correlative light and electron microscopy with fluorescent stains. Mycologia 76: 462-467. Taylor, J.W. and Fuller, M.S. 1981. The golgi apparatus, zoosporogenesis, and development of the zoospore discharge apparatus of Chytridium confervae. Exp. Mycol. 5: 35- 59. Taylor, J.W. and Fuller, M.S. 1980. Microtubules, organelle movement, and cross-wall formation at the sporangial-rhizoidal interface in the fungus, Chytridium confervae. Protoplasma 104: 201-221. Taylor, J.W. and Wells, K. 1979a. Observations of mitosis in living cells and synchrony of mitosis in Bullera alba. Mycologia 71: 502-519. Taylor, J.W. and Wells, K. 1979b. A light and electron microscopic study of mitosis in Bullera alba and the cytochemistry of some cytoplasmic substances. Protoplasma 98: 31-62. Taylor, J.W. and Wells, K. 1979c. The mitochondrion in mitotic and starved cells of Bullera alba. Exp. Mycol. 3: 16-27. Osborn, G. and Taylor, J.W. 1975. Lichenometry on calcareous substrates in the Canadian Rockies. Journal of Quaternary Research 5: 111-120. Taylor, J.W. 1981. Review of Introduction to Modern Mycology by J.W. Deacon. Mycologia 73: 1212-1213. Fuller, M.S. and Taylor, J.W. 1979. Review of Mitosis in the Fungi (I.B. Heath, ed.). Quarterly Review of Biology 54: 80- 81. Taylor, J.W. and M.E. Silliker. 1993. O'Neil Ray Collins, 1931-1989. Mycologia 85: 868-872. 2004 Rhoda Benham Medal, Medical Mycological Society of the Americas.